How often do you pop paracetamol? As a nation Paracetamol stands proud as our “go to” pill for pain. We trust it so much we buy over 200 million packs of the stuff per year! Whether it is to help with a hangover, avenge the pain of arthritis or simply see off a fever, most of us will reach for it at one point or another. For self use, sharing or even just to have them on standby it is the pill that is perceived to cure all ills. But how safe is it? Taken in the correct amount it is unlikely to cause any mischief and works well for aches, pains, and minor illnesses. Tablets are generally 500mg size with the maximum daily dosage being 4g per day. Patients regularly do not interpret “per day” as per 24 hours, slipping in at least one extra dose is not uncommon. In addition co-use of other medications also containing paracetamol may push you over the therapeutic threshold. Sinus medication is just one of the drugs often found with paracetamol as an additive. Exceeding the dose for even just a couple of days can have detrimental effects on both the liver and kidneys. This tends to be made worse if you are dehydrated or a high consumer of alcohol. 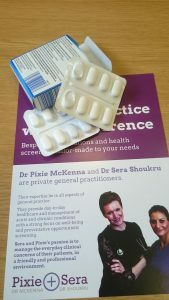 Paracetamol over dosage both deliberately and accidentally is incredibly common and sometimes fatal. To help prevent this garages and corner shops can only sell 16 paracetamol tablets, pharmacy counters are limited to 32. Sticking to the dosage generally does not result in ill effects in most healthy patients. Side effects are rare. The drug can interact with other medications so although self-medication may seem straightforward to you, it can have serious consequences if you clashes with your prescription pills. Interactions may occur with the blood thinning drug warfarin and some epilepsy medication. Those on low salt diet should also be counselled to avoid effervescent forms of paracetamol as these are packed with sodium. Whilst most patients have a valid reason to take a paracetamol, for many others it’s a form of habit in particular if they feel a headache coming on. Beware the use of analgesia where headaches are concerned! It is thought that in as many as 1 in 5 patients with chronic headaches, the pain killers they take used may be the provoking cause. Classically this so called “analgesia headache” tends to be present for 15 days or more per month. It will have either developed or worsened while taking painkillers. It occurs due to a rebound headache effect, resulting in the pain reoccurring once the effect of the pain killing pill wears off. This creates a viscous circle of pill popping and pain. So where headache and all those other aches and pains are concerned paracetamol is likely to hit the spot, just use is sensibly and follow the instructions.